These glowing Halloween pumpkins are recycled from flat round cheese boxes such as those from Laughing Cow that hold triangle wedges of processed cheese in foil wrappers. 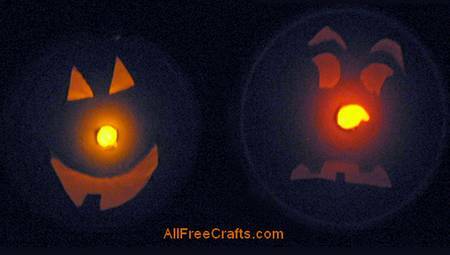 They are easy and inexpensive to make, although you will need battery operated tea light candles if you want the pumpkins to light up. Pierce a hole into the center of the box lid with the tip of your scissors, then push the upper “wick” section of a battery operated tea light candle gently through the hole, enlarging it just enough to hold the candle in place. Remove the candle and set aside. Turn the box lid upside down and draw Jack O’Lantern features inside. Larger shapes are easier to cut out and show up more clearly when you turn on the candle. 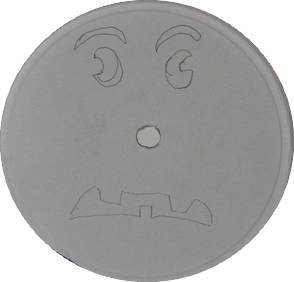 Use a craft knife (adults only for this step) to cut out the facial features. Paint the outsides of the two box sections in pumpkin orange craft paint. 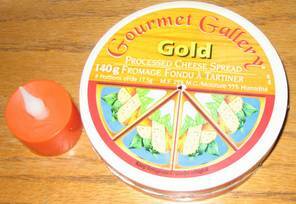 You will need three or four coats to cover the box completely, but it doesn’t take long for each coat to dry. Trace around the box lid on a piece of white or yellow tissue paper. Cut out this circle, making it a little smaller than your tracing, so it will fit nicely inside the lid. Use the paint brush to apply a thin layer of white glue to the inside of the box lid, then carefully set the tissue paper circle in place. Smooth down the edges and let the paper dry. The bottom sections of both my boxes had two small holes punched in the sides. 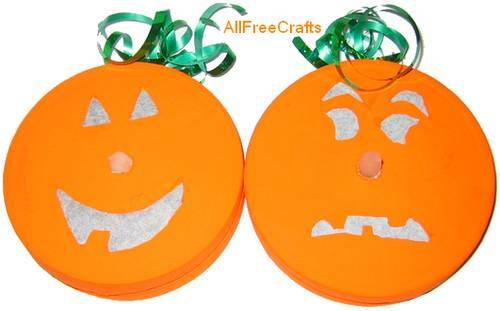 I used one of these holes to make a ribbon holder for the pumpkin. If your box doesn’t have a convenient hole like this, use the tip of your scissors to punch a small hole about halfway up the box side. Cut a piece of green curling ribbon and thread both ends through the side hole from the outside in. Tie the ends together in a knot that is large enough to prevent the ribbon from coming back out of the hole. You should now have a loop of ribbon at the top of the box bottom. Cut a smaller piece of curling ribbon and tie it around the first ribbon, close to the box. Use the dull side of your scissor blade to curl the ribbon ends. Position the tea light candle, as before, putting the “wick” area right through the tracing paper where it covers the hole in the center of the box lid. Turn on the candle, then carefully place the lid with the candle onto the bottom section of the box. 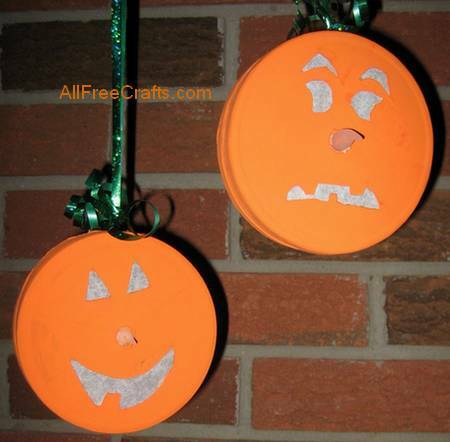 Hang your recycled cheese box pumpkin in a dark spot to enjoy the flickering jack o’lantern effect. 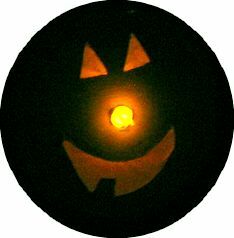 Don’t forget to turn off the candle when you are finished looking at it to save the battery for Halloween night.